Sophisticated banking requires sophisticated computing systems. But which systems offer the greatest chance for success? 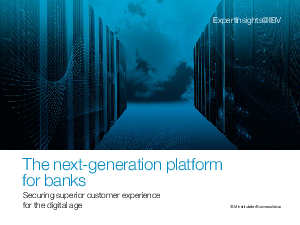 Many banks are discovering that the answer can be found within their on-premise data centers – the mainframe computer. 47 percent said they believe dual-platform hybrid cloud can accelerate innovation. While innovation and improved profitability are critical success factors for banks, it is equally important that they maintain business as usual. There can be no interruption to the efficient processing of massive volumes of daily banking transactions. In fact, 92 of the world’s top 100 banks rely on mainframes because of their ability to process huge volumes of transactions efficiently. For example, mainframes process more than $7.7 trillion USD in credit card payments annually and support 29 billion yearly ATM transactions (another $1.7 trillion USD) The newest generation of mainframe processes an astonishing 12.5 billion transactions per day, against fully encrypted data.